Gardening has a special set of requirements when it comes to footwear. You can simply garden in whatever shoes you have available, but when you start spending a lot of time in the garden, you’ll quickly discover that wearing a pair of shoes designed specifically for gardening will be a lot easier. After scouring the web for message board threads, blog posts and product reviews, we’ve rounded up these choices as the best shoes for gardening. You can’t go wrong with these shoes, based on the feedback of hundreds of other gardeners. The Original Muck Boot Company is mentioned again and again when the subject comes up about tough, comfortable, waterproof shoes that can stand up to the challenge of heavy lawn and garden use. The Daily Shoe has no laces to get in your way, but still keeps a snug fit around your foot and ankles to keep water and pebbles out of your shoes. The sole is ribbed in a way to clear mud better than most other shoes, so you don’t require a lot of cleanup after using them, and you stay steady on your feet because the soles stay clear enough to hold their grip. They wash off in seconds with a hose! 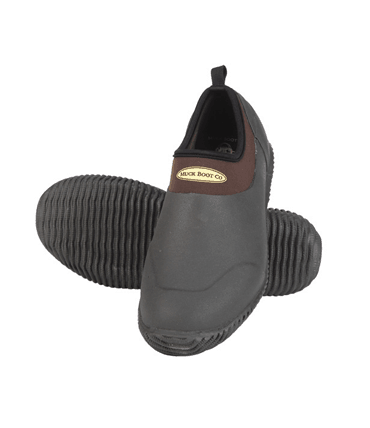 They have a 4mm flex-foam bootie with four-way stretch nylon, that is 100% waterproof, lightweight and flexible. They keep your feet comfortable all the way down to subfreezing temperatures. And they are suitable for both men and women. There are quite a few different colors and designs to choose from if you don’t want to go with plain green. You can also buy these as a shorter boot, a mid rise boot and a high rise boot, depending on how deep you plan to get into the mud. 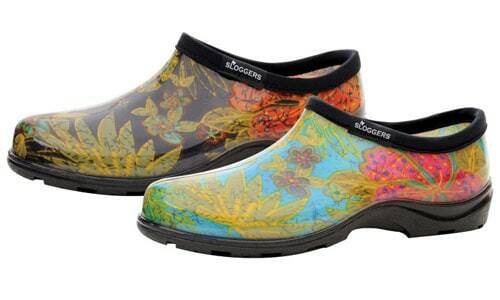 Bogs Classic Mid Garden Shoes are another shoe designed for the tough and muddy conditions in your lawn and garden. One of the coolest features of the Classic Mid Garden style of Bogs is how they designed handles into the side of the boots so that you can easily grip them and pull them on. These come up a little bit higher than a standard pair of garden shoes or clogs, which keeps your ankles and shins clean and dry and out of the dirty stuff. They are 100 percent waterproof, with 4mm of “Neotech” material to keep them dry on the inside. The insole is treated with Aegis antimicrobial odor protection, to discourage bad smells. The sole is designed to easily clear mud, and you can wash them off quickly with a hose after you are finished working in the yard. Bogs also makes a low rise version of these, if you prefer a shoe to a boot. 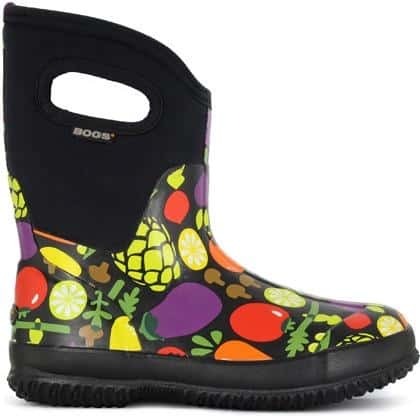 Sloggers is well known for their rain shoes and boots, but the Print Rain and Garden shoes are designed especially for the demands of lawn and garden work. They have a lower profile than their “rain only” styles, which makes them easy to take on and off. They have a heavy duty tread that is designed to last a long time, while easily clearing mud build up. Wash them off with a hose in seconds to clean them up at the end of the day. They are 100 percent waterproof, and have a comfortable insole that will allow you to spend the whole day in them without thinking about your feet. Sloggers has a ton of different patterns and colors so that you can pick out a pair that matches your individual taste. What kind of gardening shoes do you use? Leave a comment and share your best tips for garden shoes! I bought a pair of cheap welly- type short boots but there was no support in them for digging so they have ended up in the bin. I wear flip flops. Never any pebbles, plenty of air circulation and 100% waterproof. I have a pair of the sloggers pictured above. They are great for garden and lawn but no half sizes so I had to get them a bit big. They are cute as heck but after an hour they kill my feet. Any of the pretty shoes w the plastic overlay of designs, tend to split open where the bend when using them. I have tried two pair—different brands and both did this. They just sort of crack open after a few months of reasonable garden work. The rubber style mucks and that type are best as they don’t crack open. I have two pair of sloggers, one style is shown above.. I worcester in an industrial school kitchen with plenty of water, grease etc. I am on my feet for hours and we prepare, serve, and clean ( including washing dishes ) for 1,400 students every day, I have been faithfully wearing my sloggers for 3+ years and not much change in wear to speak of. and they are SUPER comfy..They are also slip resistant, and qualify for safety shoes at my employment…. All I can say is, I LOVE my SLOGGERS… thank you, for making these awesome shoes, I will be a lifetime customer, these shoes I can wear in any weather, and in any situation… THAN YOU, AGAIN….